Among the millions of items that were registered with Tokyo’s lost and found center last year was an urn containing someone’s ashes. And yet this should perhaps not surprise you — urns are handed in to lost and found centers more regularly than you might think. 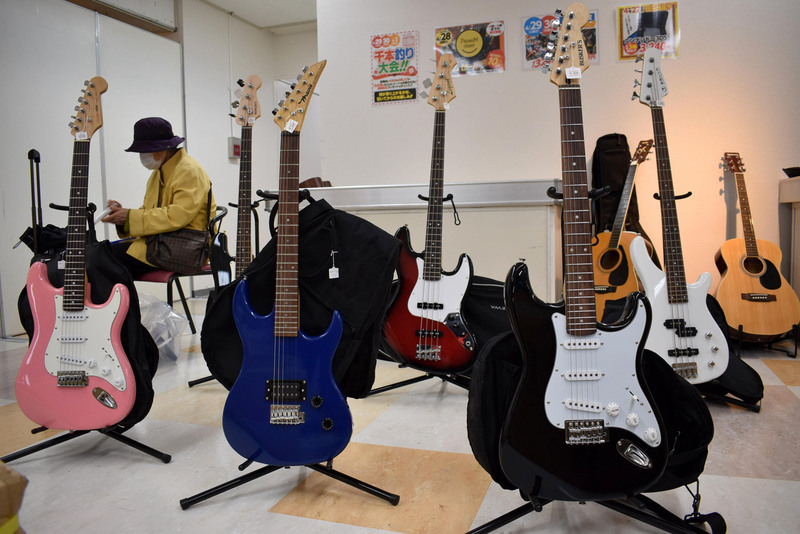 Last year alone, the Metropolitan Police Department’s lost and found center in Bunkyo Ward tried to reunite as many as 10 urns with their owners. In every case, relatives of the deceased refused to come and collect them. 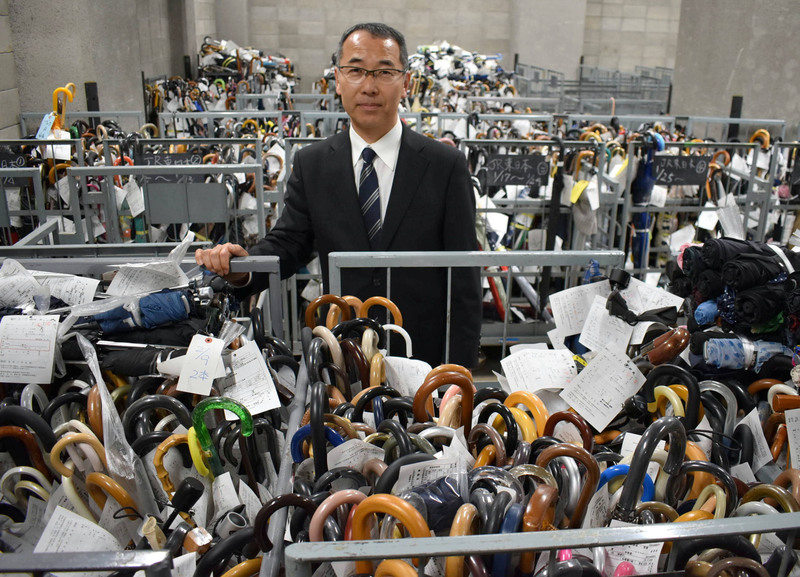 Umbrellas are one of the most common items that accumulate at the center, so much so that a 660-square-meter room has been dedicated to storing them in the basement. The room wasn’t quite full as of late April but Shoji Okubo, head of the center, says that this situation will change once the rainy season starts in June. 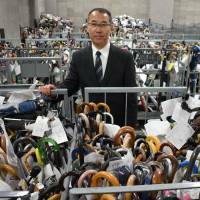 Okubo says that roughly 3,000 umbrellas are found in Tokyo on a typical rainy day. In 2016, the metropolitan police handled a total of 381,135 umbrellas across the entire year. Each umbrella is fitted with a tag that lists detailed information on when and where it was found. It is then stored according to the date it was handed in and the rail operators that logged it. 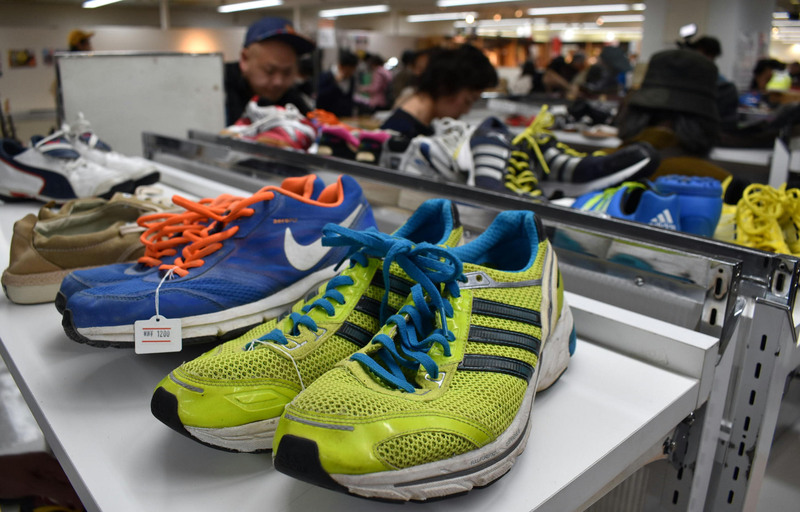 “It’s really hard for us to store items in a systematic way so that they can be found easily when a person comes in to claim something,” Okubo says. The center is where most waylaid items found in the capital end up after being temporarily stored at police stations or by facility administrators such rail operators or department stores for about one or two weeks. On April 27, the center hosted around 900,000 unclaimed items, ranging from wallets and iPhones to sunglasses and the aforementioned urns that were found abandoned in various parts of the city. According to the National Police Agency’s latest white paper, a record 26.7 million items were reported to police departments nationwide in 2015, excluding cash. In Tokyo alone, 3.83 millions items were recorded by the Metropolitan Police Department in 2016, according to data compiled by the agency. By comparison, the center handled just 1.37 million items in 1997. Driver’s licenses and credit cards were the most common items handled by the Metropolitan Police Department last year, accounting for 15.6 percent of the total. Train passes, clothes and shoes were also high on the list. It’s also worth noting that a record ¥3.67 billion was handed in to the Metropolitan Police Department last year, surpassing the ¥3.5 billion that was recorded in 1990 during the nation’s so-called bubble era. In an attempt to handle Tokyo’s ever-increasing volume of lost property, the six stories the center utilizes in a building in Bunkyo Ward is currently under renovation to expand its storage space. “However, if the overall amount continues to grow, our storage space would eventually be full,” Okuba says. The center stores the items it receives in an orderly manner. Officials at the center will then try to locate the owner from the information they can glean from the item, typically making an average of about 250 phone calls a day and sending notices by post, Okubo says. If the police find a foreign passport, they will forward them to the embassy concerned. “It’s a lot of work,” Okubo says. In 2016, an average of 286 people a day came to the center to pick up their belongings. As you’d expect, the vast majority are overjoyed to be reunited with their lost property. Foreign visitors are especially grateful, Okubo says, with some even asking officials at the center to pose in photographs with them. However, not all items are reclaimed by their owners. While valuable property such as cash and credit cards are often returned, most people aren’t interested in coming down to the center to reclaim items such as an umbrella or hat. In 2016, the center reunited people with just 0.8 percent of umbrellas and 3.8 percent of clothing or footwear. By comparison, 74 percent of the total value of cash handled by the center was returned. The Lost Property Law stipulates that anyone who finds an unaccompanied item must return it directly to its owner or hand it in to a police station or a facility administrator. Those who find lost items are entitled to receive a reward of 5-20 percent of the property’s value. Once three months have passed, the law stipulates that unclaimed belongings — excluding items containing personal information such as credit cards — become the property of the finder. Finders who have clearly indicated an interest in the items then have up to two months to claim them before they become the property of the local government. People handed in cash worth ¥3.67 billion to police in Tokyo last year, ¥2.7 billion of which was returned to its rightful owners. Roughly ¥500 million was given to the people who found them, and about ¥440 million was added to the metropolitan government coffers. The remaining items are sold to junk dealers, and the profit is pocketed by the metropolitan government. There is a perception that people in Japan generally hand in items of lost property to a police station or kōban (police box), and you don’t have to go far to find stories online of people recovering wallets stuffed with cash. Experts partially attribute this to education by parents who teach young children to take lost property to a police station. As a result, Okubo says that children sometimes bring in ¥1, ¥5 and ¥10 coins they find on the street, or even a little hair band. People sometimes hand in stray animals to police stations. In 2016, around 1,000 animals were registered as being lost, including dogs, cats and parakeets, as well as ferrets, frogs and even goldfish. Police usually pass the more unusual animals on to enthusiasts or animal shelters. They tend to hang on to stray dogs for a while, though, in an attempt to locate their owners. 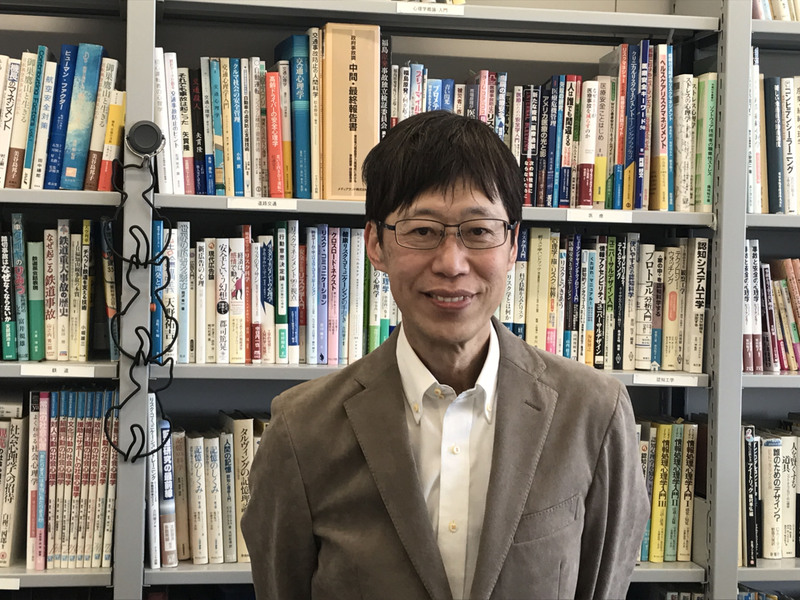 Shigeru Haga, a professor of psychology at Rikkyo University in Tokyo, says it’s easy to forget personal items in the modern age. The proliferation of smartphones may be partly responsible for the increasing volume of lost property over the past few years, Haga says. Deflation has also made items such as clothes increasingly cheaper and easier to replace. Haga says many people these days simply purchase a new item rather than go to the trouble of retrieving an item of lost property, which can require the person to fill out a number of claim forms. Haga says time and attention are two key factors in losing things, advising people traveling on trains to put phones in their bags or pockets one stop before the station they are planning to disembark in order to mitigate this. If nobody claims an item, the metropolitan government and rail operators are more likely to sell it to a junk dealer. Saneyoshi Yogi, head of Saitama-based PX Co., is one such dealer. 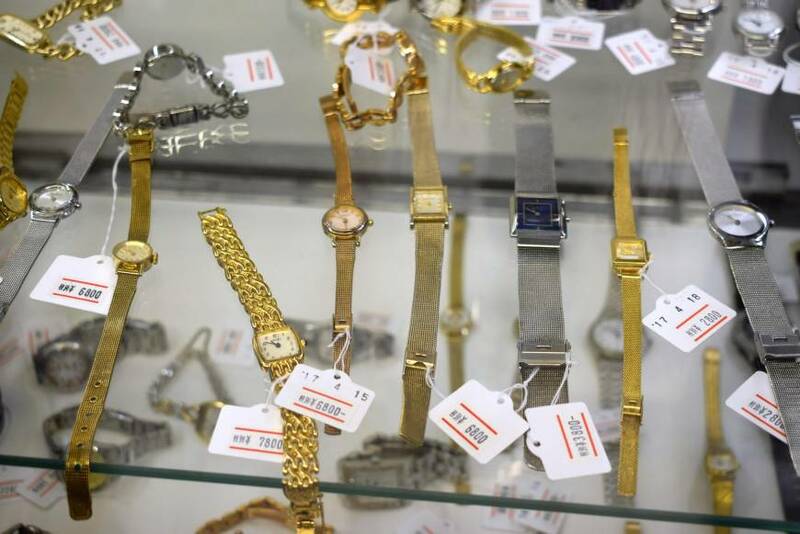 He regularly bids in auctions to buy thousands of unclaimed items in order to subsequently sell them on the secondhand market. Rail operators hold these auctions several times a year, selling all sorts of items in huge cardboard boxes, Yogi says. Yogi says he is often able to guess the contents of a box before opening it based on the season of the previous three months. If an auction is held in May, for example, the boxes are more likely to contain things found during winter — namely, lots of scarves and gloves. If it’s held in September, the booty is more likely to be tons of umbrellas. 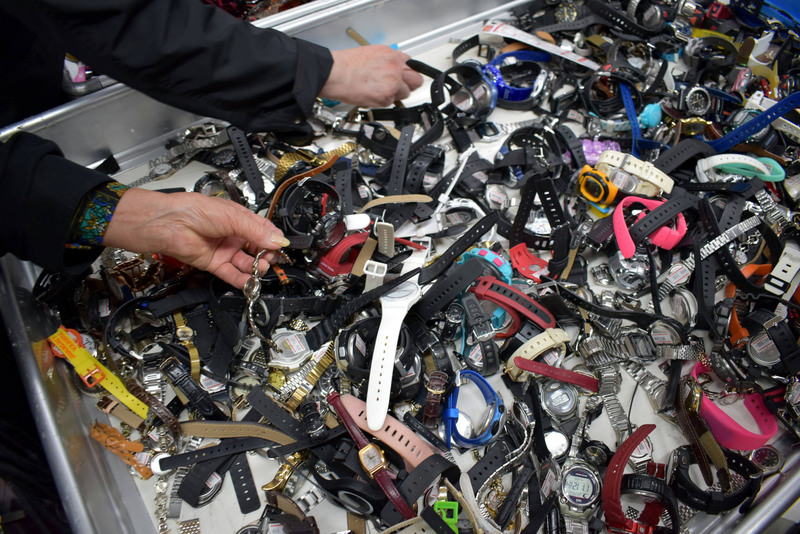 PX spends an estimated ¥60 million annually at these auctions, subsequently selling the unclaimed items at department store sales about four times a year. 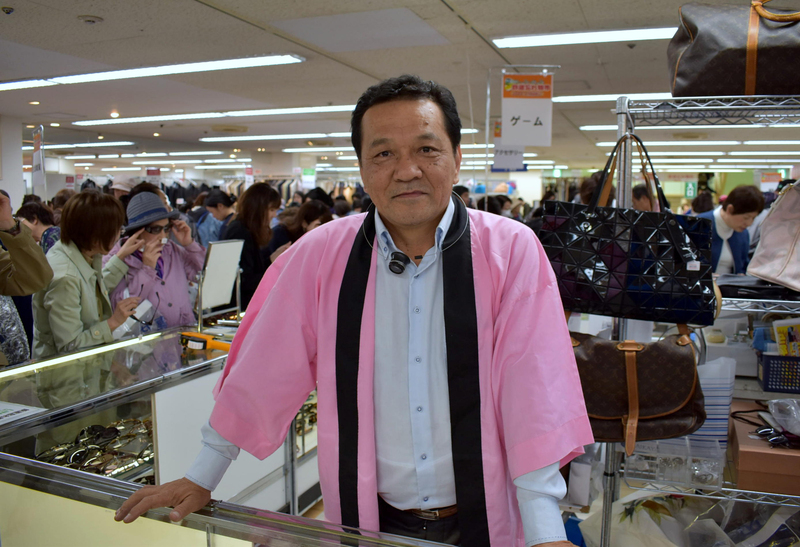 At a recent secondhand market in Saikaya department store in Fujisawa, Kanagawa Prefecture, hordes of people were picking their way through a mountain of items in an attempt to find a bargain. 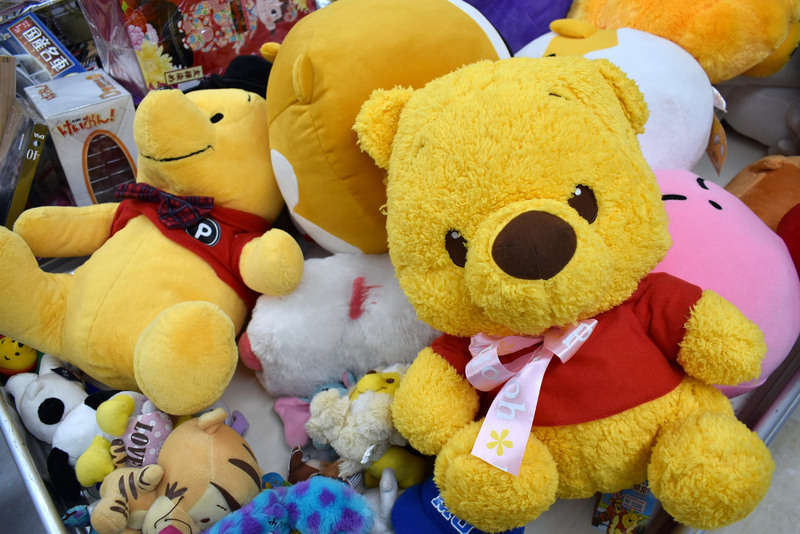 Yogi says roughly 40,000 items were on sale at the market, including such things as suitcases, electric guitars, luxury watches and giant stuffed animals. The bargains on display at the sale were indeed mind-boggling. “I’m having a great time,” says Saki Shirai, 32, standing in front of a glass cabinet and examining a pink Coach purse she was considering purchasing. “I come here almost every time the market is held. Usually, however, all the luxury items are gone by the time I get here,” she says, holding an unused wooden cutting board she found. 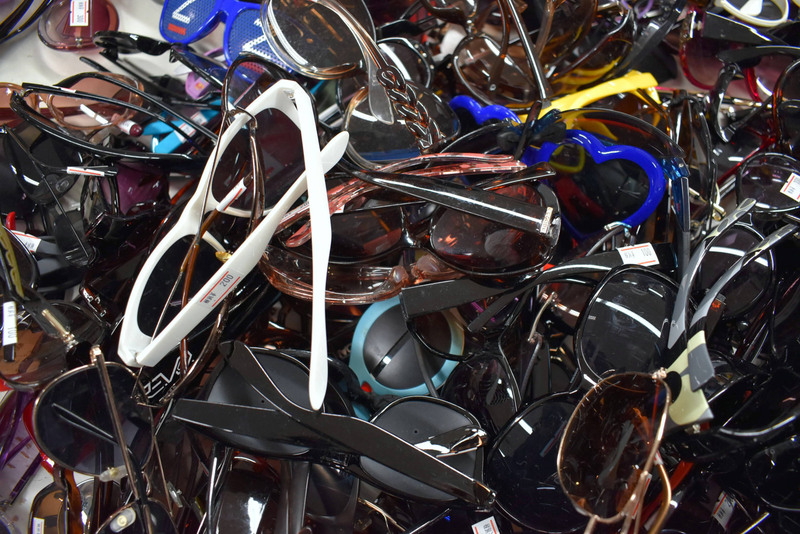 Ryuji Maruyama, 64, was also trying to choose a pair of sunglasses from a huge box filled with hundreds of them. Yogi says it’s not unusual for luxury items to sell out quickly. In total, however, about 30 percent of the items on display at the market are picked up by buyers. PX sells the remaining items to countries such as Philippines, Myanmar and Thailand. “We shipped 20,000 umbrellas to Myanmar yesterday,” Yogi says. Many people think PX makes a sizeable profit, but the reality is something else, he says. “Our core business is actually real estate and home appliances. We are not making much out of this secondhand market at all,” he says. “We see the market as a matsuri (festival) — we are simply having fun. It’s great to see so many customers every time we hold a market here.